While several screen adaptations of Daphne du Maurier works remain highly revered by film fans and scholars — specifically, Alfred Hitchcock’s Rebecca and The Birds and Nicolas Roeg’s Don’t Look Now — the 1952 drama My Cousin Rachel has fallen by the wayside. Today, it’s mainly remembered for nabbing Richard Burton a ridiculous Oscar nomination for Best Supporting Actor – ridiculous not because he’s bad in the film, but ridiculous because he’s the lead actor and appears in almost every scene in the picture. The new cinematic take of the tale, also named My Cousin Rachel, finds Sam Claflin (Finnick in The Hunger Games franchise) cast in the Burton role — he’s Philip, a young Englishman who convinces himself that his beloved uncle and protector Ambrose, who succumbed to dementia and soon died of a brain tumor, was actually murdered by Ambrose’s new wife. 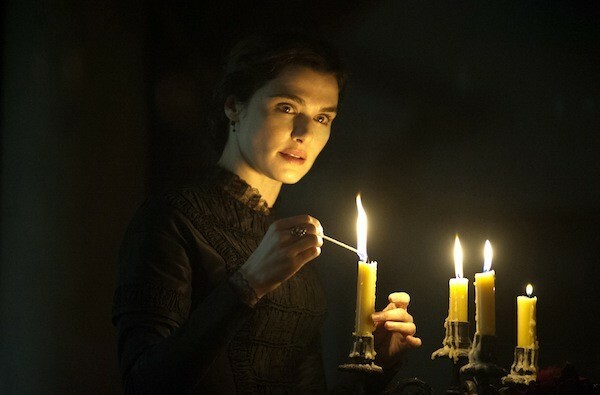 That would be Philip’s cousin Rachel (Rachel Weisz), and the young heir plans to confront her when she arrives at his Cornwall estate for a visit. Instead, he immediately succumbs to her charms and proceeds to act in increasingly immature and irresponsible ways. On balance, both screen versions of My Cousin Rachel are of comparable quality. The 1952 version provides better ambience as well as a revelatory performance by Burton in his first American-made film. (Claflin isn’t bad, but let’s just say no one will be worrying whether to place him in the lead or supporting category come Oscar time.) Where this new version improves upon its predecessor is in the character of Rachel: She’s far more developed here, and Weisz gives a nicely shaded performance that eclipses the one given by Olivia de Havilland back in ’52. The central mystery of whether Rachel is evil or innocent reverberates throughout both adaptations, but there’s no question that Weisz delivers yet another master class in acting.